The main issues are considered in this topic: offered methodics for calculating of electrical weeding machine`s current, circuit impedance and the distribution of electric potential in earth surface between the destroyed weed and buried electrode; calculation formulas and graphs of electric potential distribution are shown. The device is developed for aerosol sanitary processing of cattle which allows at the expense of a preliminary hydro jet sink and mechanical purification of the dirt which stuck to a surface of an animal, and also the automated consecutive supply of the washing and disinfecting liquid, to reach high-quality processing of cattle. It provides rational use of a preparation and reduces finally extent of environmental pollution. This paper looks at the question of reducing power consumption and improving energy efficiency in the technological process of distribution liquid feeds in a pigsty. There is suggested a way of saving energy by optimizing the power of electrical motor of centrifugal pump supplying the feed into the piepline. The energy saving effect is estimated and reducing power up to 10% is shown. Questions of the plug-and-play automated system of machine milking of cows realized by the automated milking device with microprocessor management and еlectronic-mechanical elements мodular type are considered. It is resulted the block diagram, functional distribution of memory single-crystal microprocessor АТ8335, features of functioning. Moving milk transport communications milking plants is a process far from effective. The main disadvantages of this process – a strong influence on the hydromechanical milk, lactic-air mixture with a relatively large gas content and precipitation of contaminants on the surface of parts and assemblies milking machine. As a result, the quality of milk and dairy products especially with a high-deteriorating, declining terms of their storage. In order to preserve the quality of milk discusses the management of the interaction of milk and detergent solution with the surfaces of the line of nodes of breast milking machine. Proposed methods and equipment can extend the research on the quality of milk. 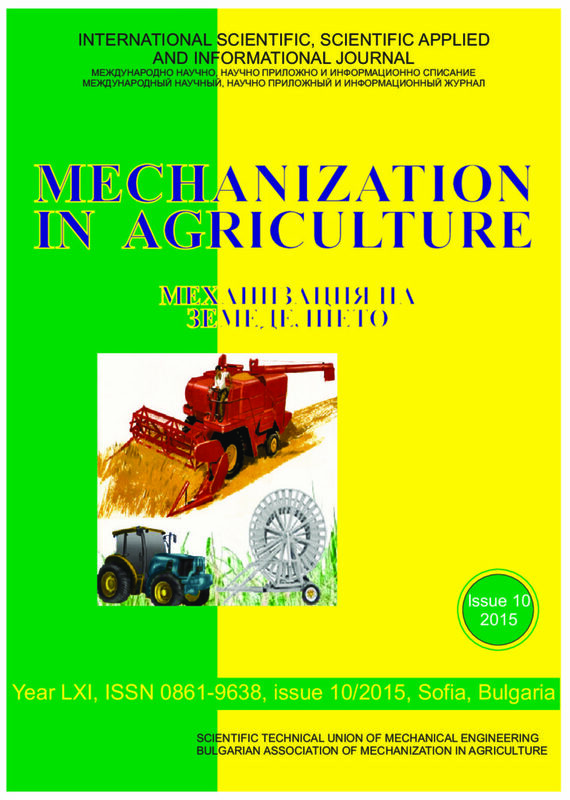 This paper presents a research of a controlled nitrogen application on 10 ha grassland. The experiment consists of 2 years of periodical application of manure and mineral fertilizer. Before each cutting of the grass the surface is scanned with a N-sensor. When feeding high quality silage to heifers from the age of two, there is a risk of energy oversupply. Depending on the feeding value or scarce availability of silage or corn silage diets with high proportions of straw is often incorporated. For an energetically standardized young cattle supply of straw proportion can be more than 20 % of dry matter. But with an increasing proportion of straw leave the animals increasingly the straw on the feeding barn. This can also be observed in limited feeding systems and a multi-day leave the straw in the manger is to be rejected from feeding hygienic point of view. The calculated energy and nutrient intake does not match the recorded. For this reason, it was investigated whether the grinding of straw with the straw mill selective feeding significantly limits. The world‘s first fully automated milking rotary AMR™ combines the advantages of fully automatic milking in the VMS™ single box and the conventional rotary milking. So the first modular AMR™ automates udder preparation, attaching the milk cups and the teat dipping/ -spraying in a rotary milking system. Through three different robot modules – preparation and cupping module in double- the individual steps are carried out. With the current state of technology can be automatically milked per hour to 90 cows. This paper investigates the effects of fully automated milking system to the milk quality and cow behavior.